Tidewater Cave is a small cave southeast of Leyawiin containing trolls (quest-related). It contains only one zone, Tidewater Cave. This cave can be fully explored before starting the related quest. However, the quest object (the Eye of Nocturnal) will not exist until you have started the quest. Inhabited by leveled trolls identified as "Kalperklan Trolls" (and "Azhklan Trolls" outside). Depending upon your level, these trolls can be much stronger than normal trolls. Strangely, all Kalperklan Trolls carry several sets of calipers. Use the water to your advantage if you are struggling with them. If you are trying to complete the Shivering Isles quest Work is Never Done, the trolls in this cave can be a useful source of calipers. This cave contains 2 Cairn Bolete plants. 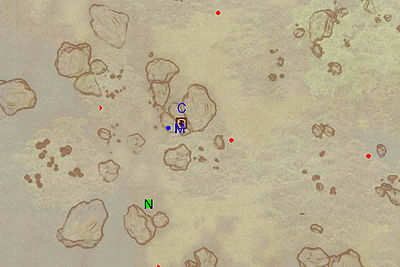 This location's map marker (M on map) is named Tidewater Cave (editor name TidewaterCaveMapMarker0001). The entrance door is ENE of the marker, 10 feet away. 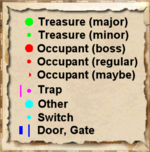 This is a very straightforward dungeon. Head down the hall and find two enemies. 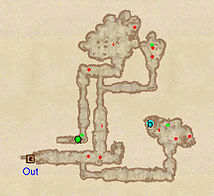 Heading down another will lead you to an open area containing three trolls, the quest item, and a chest. You may wish to head north as well, as you can get a small and large treasure chest; you must kill five trolls to get to them. This zone has sections that are underwater. Eye of Nocturnal at location Q on map (only appears after related quest has been started).